The Vineyard Gazette - Martha's Vineyard News | Holiday in Aquinnah: Why Leave Town at All? What began as a small parade for children has morphed into a townwide gathering in Aquinnah. 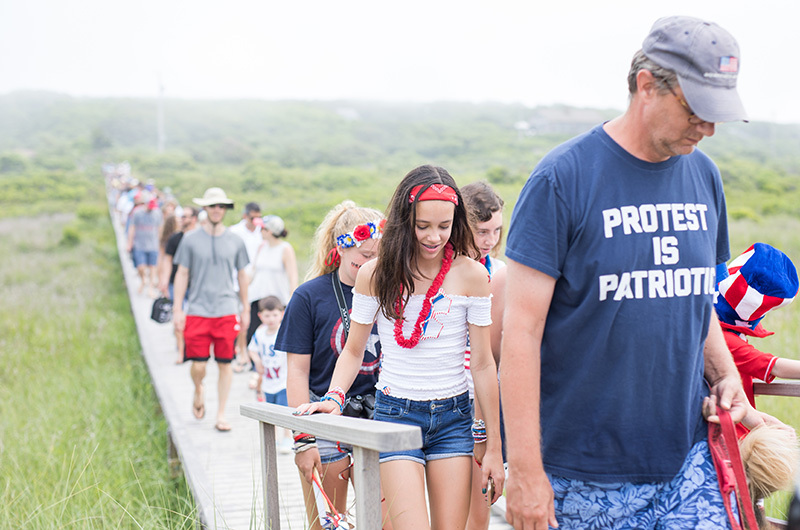 Sixteen years ago, five Aquinnah families decided they didn’t want to make the trek into Edgartown on the Fourth of July. But they didn’t want to miss the parade either. So instead of brooding about down-Island traffic and lamenting the lack of festivities in their neck of the woods, they started their own tradition: the Aquinnah children’s parade. “It used to be us, our neighbors, a few others, standing on the side of the street, waving flags as our kids ran by,” said one of the parade’s founders John Patton. This year, the parade had some 25 floats, nearly 100 walkers and even a few invaders from other Island towns. With remarks finished, Mr. Murphy bestowed the honorable distinction of grand marshal on Susan Jensen Schiller, and the flag-waving children, parents and Aquinnah residents were treated to Hall of Fame musician Arlen Roth’s rendition of the national anthem. He played on his Martin CEO-6 guitar as the rest of the crowd sang along. 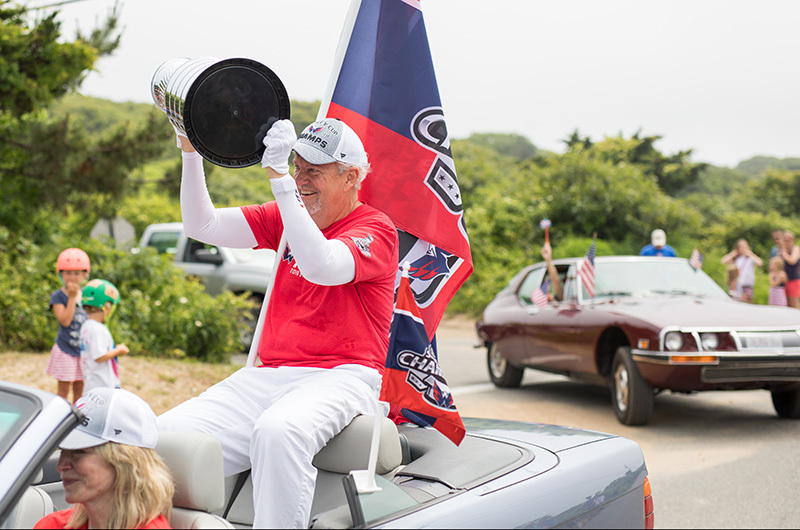 “I love my community here, I love playing for the kids, and I love getting to show off some of my cars in the parade,” Mr. Roth said. This year he drove his yellow Buick Skylark convertible. Mr. Patton’s children showed him the route. Once walkers in the parade, two are now old enough to drive and one is going off to college in the fall. “They love it, and are still so into it,” Mr. Patton said. Son Jack was behind the wheel of a black 1963 Mercedes 220SE, with his sister Dagney and about five other friends in tow. 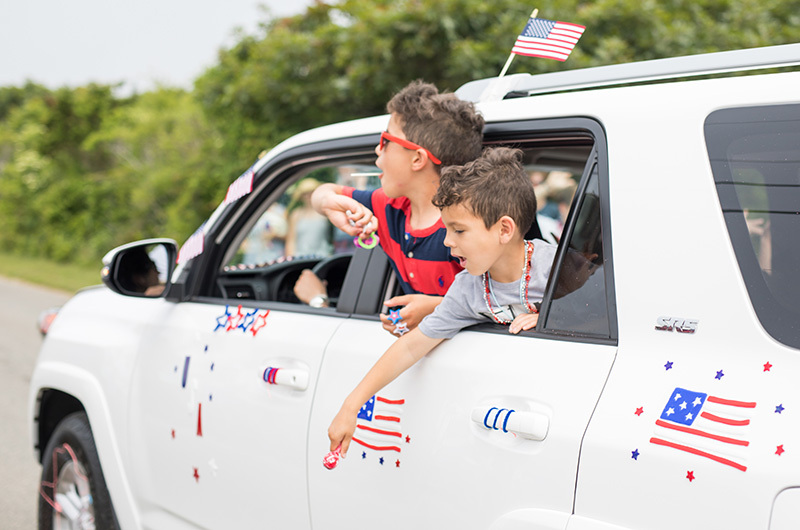 As excited as they were about getting to drive the hot rod, they still blushed when their father walked by in a tucked-in T-shirt, American flag sunglasses and a neckful of shiny blue beads. “We don’t tell him what to wear,” Jack said. Once the floats, fire trucks and police vehicles, all decked out in the stars and stripes, turned the corner off Old South Road, the children rushed onto Philbin Beach for the treasure hunt. While younger kids followed white skull and bones cairns, older ones followed black markers. Meg Bodnar’s children and their friends from Colorado gathered around to show her their loot, which consisted of blowpops, ringpops, Tootsie-pops, smarties and bubble-gum. “It was too easy!” yelled youngster Malia Bodnar, with a cherry-pop stained smile. Most who made it to the beach didn’t plan to leave for the rest of the day. The Pattons were ready to get in the water. For John and his wife Lisa, this Fourth of July journey down to Philbin marked a special moment in their lives. “All these kids learned to drive together, they all decided to go to the beach after dinner together, they went through those parts of their lives together,” Mr. Patton said. Now some are moving on to colleges like Tufts and Columbia. “Sixteen years in the future, they’ll have to bring their children,” added Lisa. They’ll have to bring their tucked-in T-shirts too. More photos from the Aquinnah parade.